The products intended for use in automotive (chiptuning for gasoline or diesel and systems for the elaboration, electronics, of the engines) can be used only and exclusively for racing use (sports) in closed circuits, private circuits or private areas. Our Company disclaims any responsibility for different uses. The company assumes no responsibility for any damage caused to persons and / or property, caused by the products purchased (or by the use, inappropriate, of the same) intended exclusively for sport use. Chip tuning are preset under construction, because the user has the possibility to modify the control parameters of these chiptuning, the "italianspeed.eu"can not be held liable for any damages that might be caused by the products, to the motor or other components of the car, such as direct or indirect result of tampering by the user or whoever it. The company, disclaims any liability for any use not in accordance with the laws of the country in which additional modules are used. In accordance with the provisions of Legislative Decree 185/1999, implementing Directive 97/7/EC on the protection of consumers, the person who buys our company products for purposes that are unrelated to his professional activity, and outside the premises, has the right to return the products purchased and require the replacement of the goods or a full refund with the exception of transport costs (both for sending and for the return of goods) communicating the decision to by registered letter within 14 working days from the date of receipt of the package or the delivery of the goods. The notice may also be sent by fax or telegram, provided that the decision to exercise the right of withdrawal is confirmed by registered letter with return receipt within the following 48 hours. The letter should contain a copy of the purchase invoice accompanying. Upon receipt of the letter, the customer will be contacted to receive instructions for the return of the goods, which in any case must be returned pre-paid (fees by the customer) in original packaging and with seals integrates complete in all its parts. Refund will be made, in accordance with law, as soon as possible and no later than 30 days after the return of the product. 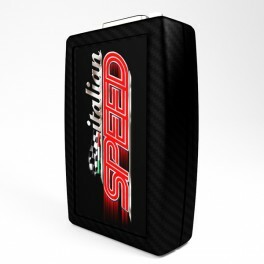 Shipment until receipt in the warehouse of the "italianspeed.eu" is under the full responsibility the customer and the Company is not liable for any damage, theft or loss for returned shipments not insured. - name, phone number and email, to be contacted by the service center. After receiving the information needed by the service center, the products must be packed in an appropriate way, in their original box and shipped pre-paid (fees by the customer) to the company headquarters. Following repair, the product will be returned to the customer by charging the cost of transport to the common market prices. Goods shipped under warranty, including withdrawal at the headquarters of the company, is the sole responsibility of the customer. the warranty does not apply in the event of accidental damage to the product, unless it is not received proper notice within 48 hours of receipt of the package and in any case prior to installation. This Web Site and the materials contained therein (documents, images, software, information and other materials) are the exclusive property of our Company. Any unauthorized use of the materials contained in the website is strictly prohibited, unless prior written consent has been obtained from the owner of the material in question. All rights reserved. Cookies are text files that the Website send to the browser of the user. The browser saves informations and transmits them back to the server of the Website when the browser accesses the Website again. (b) permanent cookies, cookies that remains in the browser folder for more time (it depends on the duration of each cookie). The use of session cookie (which are not stored permanently on the user's computer and are deleted when you close your browser) is aimed at (I) easier navigation of the Website and easier use of applications delivered from the Website; and (II) statistical information about the use of the Website and check the correct operation.The use of persistent cookies is intended to provide specific services requested by the user. For example, when you log on to the Website by entering your email and password, users will not have to make the login process every time they connect to the Website but the Website leaves log in automatically; This is done through the installation of a cookie on your computer. You can visit the Website without cookies. Most browsers accept cookies automatically. You can avoid the automatic registration of cookies by changing the settings on your browser; for more information on how to do this you can refer to the instructions of the browser being used. Through the browser you can cancel at any time any cookies already on your hard drive. The choice not to accept cookies from the browser may make it less easy navigation of the site and will be impossible to carry out procurement procedures. • of third parts, generated by a website other than the one you are currently visiting. The cookies used by the owner of the Website are a combination of these three types: some serve only for opening and maintaining a session (temporary cookies). In this case, the closing of the session or browser will make them unusable both to us and to third parties, although they remain stored on the PC (persistent cookies). For purely statistical reasons, they are also released third party cookies, for the measurement of aggregate information. In order to offer a better service, we are constantly analyzed data collected on cookies; this data indicates exclusively and anonymously how our website is used, and what areas and sessions are of most interest and use to navigators. To the user is given the option to set the browser to accept all cookies, only some, or reject them. We make it known, however, that not accepting cookies may make it impossible to provide the service in the case of access to some areas/functions of the Website, and also the inability to proceed with the purchase phase. It also recalls that at the end of each browsing session, the user can in any case be deleted from your hard drive both the navigation cache-memory cookies is collected. The treatment is done through automated means (eg. Using electronic procedures) and/or manually (eg. on paper) for the time necessary to achieve the purposes for which the data were gathered and, anyway, in compliance with local regulations.